On the other hand, Vice President Mike Pence is concerned about Facebook and Google, according to a source with direct knowledge. Though Pence isn’t yet pushing internally for any specific regulations, he argues these companies are dangerously powerful. The source said the V.P. worries about their influence on media coverage, as well as their control of the advertising industry and users’ personal info. When private discussions have turned to the idea of busting Facebook and Google, Pence has listened with keen interest and is open to the suggestion that these two companies need shaking up. 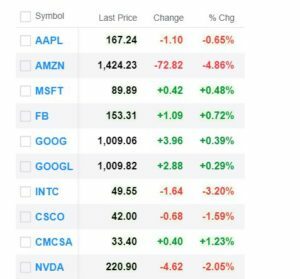 While the focus of which tech stock is a potential problem changes from day to day, news is starting to weigh on the sector. And, that seems unlikely to change in the near term. Tech companies have made missteps in the past year that fuel critics. For traders, it could be profitable to find the company in the headlines and trade the stock based on expectations of a decline. 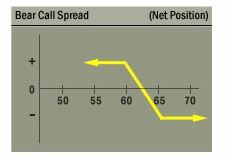 Of course, options allow traders to benefit from an increase or decrease in price or even from a trading range. However, options will all expire and that makes it important to determine not only which company will sell off but also when. If the timing is off, the option could expire without delivering a profit to the trader, even when they are right on the trade idea. To minimize the risk of this problem, traders could consider PowerShares QQQ ETF (Nasdaq: QQQ), an ETF that tracks the large cap tech stocks in the Nasdaq 100 index. The ten largest holdings of the ETF are shown below. On any given day, there will be some large movers in the Nasdaq 100 and the general trend in the individual components has been down. In fact, the index seems to be leading the market to the downside, which is not surprising given its components. In the short run, there is unlikely to be a significant rally in QQQ. It will take time for traders to gain confidence that the sector is recovering from its problems. That creates a trading opportunity. For QQQ, we have a number of options available. Short term options allow us to trade frequently and potentially expand our account size quickly. Short term trades also reduce risk to some degree since there is less time for a news event to surprise traders. In this case, we could sell an April 6 $160 call for about $2.00 and buy an April 6 $160.50 call for about $1.80. This trade generates a credit of $0.20, which is the difference in the amount of premium for the call that is sold and the call. Since each contract covers 100 shares, opening this position results in immediate income of $0.20. The credit received when the trade is opened, $0.20 in this case, is also the maximum potential profit on the trade. The maximum risk on the trade is about $30. The risk is found by subtracting the difference in the strike prices ($50 or $0.50 times 100 since each contract covers 100 shares) and then subtracting the premium received ($20). This trade offers a potential return of about 66% of the amount risked for a holding period that is about one week. This is a significant return on the amount of money at risk. This trade delivers the maximum gain if QQQ is below $160 when the options expire, a likely event given the stock’s trend. Call spreads can be used to generate high returns on small amounts of capital several times a year, offering larger percentage gains for small investors willing to accept the risks of this strategy. Those risks, in dollar terms, are relatively small, about $30 for this trade in QQQ.